In reviewing comments on past posts I came across a comment, or rather question, asking for an inexpensive homemade way to clean car headlights. As usual, there are a few different ways to do this even with household, non-toxic products. Now, when I say clean the headlights, I am referring to the clear covering that, over time, can accumulate a film or cataracts, dulling the amount of light shown through them. After a little digging, I came up with the following methods to clear that cloudiness away. 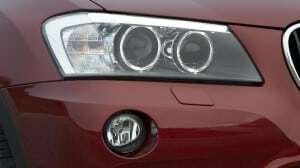 The first step in restoring your headlights is to determine what is causing the cataracts. If the dulling is simply from years of caked on filth, then a harsh abrasive may be in order. As you don’t want to kill yourself scrubbing, first take off the cover and immerse it in a white vinegar bath. Leave the lamp cover in the bath for about an hour. The acidity of the vinegar should loosen any grime. Then, use a rough sponge and rub away the cloudiness. Another way is to soak in water, dish soap, and salt. Dawn is a good dish soap for this method as it is formulated to cut through grease. The salt adds an abrasive quality. After a while of soaking, give the cover a good scrubbing in the same bath. The combination of soap and salt should be enough to remove those years of crud. Toothpaste and baking soda also make good abrasives. On the other hand, if your car’s cataracts problem is due to scratches and not filth, then using abrasives is the opposite of what you want to use. In this scenario, you want something that is going to smooth away those micro-cracks and bring the covers back to life. You’ll know which category your headlamps fall under by the feel of the plastic under your fingertips. If it feels rough or even remotely callous, then abrasives are a no go. Start with the vinegar bath. No matter the reason for the cataracts, vinegar won’t harm the plastic either way. Again, let soak for about an hour. But instead of scrubbing afterwards, gently rinse off and dry with a dry soft cloth. For any gunk left over I recommend cooking spray (plain cooking spray, not butter flavored or whatnot). Spray some on and buff the lamp to a shine with a soft cloth. The soft cloth is important; you want to treat the headlights like you would your own pair of glasses. Any clear lubricating substance could effectively work as a cleaner as long as you know that it dries clear with very little to no residue. Be careful of wax products as wax tends to leave a heavy residue, actually worsening the cataracts effect. Yet, I still recommend the cooking spray as it cleans and shines at the same time. Perhaps the aerosol is responsible, but that’ll be another research project. So when your car’s headlights become dull and lifeless, pop them off and get to cleaning with the previously mentioned methods. Remember to know beforehand the cause of the dulling; is it years of dirt or accumulation of scratches? That’ll determine if you need scrubbing power or something to fill in the crevices. No need for expensive cleaners from your local auto parts store. But if you prefer a store brand specifically designed to clean headlamps, be prepared to spend no less than $25.00 on a kit that you may only ever use once. However, some vinegar and Pam could be all you need. May this cleaning tip have you and your car seeing clearly. Im going to give it a try. Easy and with all common household items. Thx for the tips!!! !